As we’ve already discussed the Case-Shiller index and mortgage metrics in order to assess the health of the housing market, I would like to take a slightly different approach: affordability. In order to gauge affordability in the housing market today, I will analyze two different ratios—the ratio of price to income, and the ratio of price to rent. We will define the ratio of prices to income as the ratio of house prices to median household incomes compared to their long-run average. Likewise, we will define the price to rent ratio as the ratio of house prices to annual private-sector rents compared to their long-run average. The Economist has pulled price information for properties from Zillow in order to illustrate these ratios for some of the nation’s biggest cities. I will focus on the nation’s two biggest metro populations: New York and Los Angeles, and the US average, for simplicity’s sake. As you can see in the figure below, the price to income ratio for all three of these locations is higher than the long-run average (represented by the horizontal red line = 100), indicating that homes today in these areas are less affordable compared to income than the historical average, especially in LA and New York. 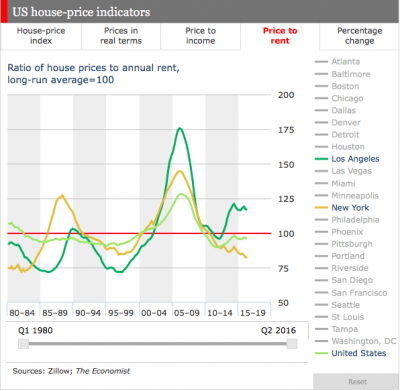 In terms of the price to rent ratio, we see from the price to rent graph that New York and the US average is below its long-run average, however, LA is above its long run average. This illustrates that the price to rent ratio in the US, on average, is on-par with fair value, however, in some metro areas, like LA, home prices are much less affordable than annual private-sector rents, in terms of long-run averages. 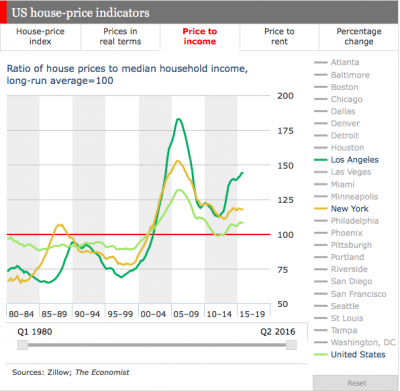 The two graphs demonstrate the growing disparity between housing markets in the US, in terms of geography. Even though home prices in the US, on average, are close to fair value; some metro areas like LA are no where near the average long-run affordability levels when compared to income. I appreciate you pointing out that a lot of house prices and affordability really depends on the location that an individual is looking at and how you focused on price to income. There is a large variance due to geography, and I’ve noticed this moving from Oklahoma, to Massachusetts, to Washington. A lot of in part seems to be a result of population vs. the amount of area there is. As a result, I think size of housing would also be interesting to look at – what you can afford to buy in Texas is probably double or triple the size an individual would be able to afford in Boston. In addition, while you looked at two big cities, I wonder how big the differences in affordability is between cities vs. small towns – I imagine pretty large. Lexington, for example, has pretty cheap rent, especially due to recent third year housing, and it would be interesting to see how it compares to other city environments – for example D.C. This is probably something that we’re about to find out soon as we enter the labor force and gravitate to jobs in cities. Looking at rural v urban would definitely be interesting, but I like the comparison you made between New York and L.A to test affordability of housing. I also think it’s interesting to look at these cities through the land restrictions they have. New York and Los Angeles are both somewhat constricted by water, which limits their expansion more than a city like Oklahoma City. Looking at the geographic constraints of city in relation to prices may be just as interesting as adding in population since they’re in direct competition with each other. As cities expand vertically instead of horizontally, price per square foot becomes the best measure across the country. Net post, will wait for others to pitch in. There’s a lot of work on related topics in urban economics, some tied to geology – is there open land – and some to political structures, such as whether suburbs can set up rules to keep “others” out (eg minimum lot size). And there’s also wide variation in the performance of local economies, in the City of Detroit you can likely buy a house for less than $1,000, and a nice house for a few months’ of NYC rent. This is a good example of why primary markets will not experience much growth in the foreseeable future. Prices are just too high. Refer to my recent blog post, it is becoming uneconomical to live or work in cities like NYC or LA. It would be interesting to see these affordability ratios against recent real estate market growth. My guess is that they would be inversely related, or the cities will the least affordable real estate experience less growth in value and rents. It is interesting to note that the two main markets shown here, NYC and LA move mostly in tandem with each other. Different cities and geographic markets are constantly at different phases in the development cycle, meaning that their graph lines would not sync up as well with those of LA and NYC. For example, Houston is in the declining phase, whereas Northn New Jersey is just beginning to recover. However, it is clear that the US average line also fits reasonably well with these two large markets. I would be curious to view how other cities fit this pattern, and which don’t. I would also be curious to see how heavily the greater LA and NYC MSA’s weigh in the overall US housing market (I know 1/16 of the country’s population lives in the New York-NJ-Long Island-Stamford area). There is a growing literature on regional disparity. The biggest finding is that “open” cities (those with no perimeter, such as Atlanta or Denver) look quite different from San Francisco, which is bounded by ocean, bay and hills/mountains. Seattle and Honolulu are likewise physically constrained from outward sprawl.